They called on state-owned BOC to end its funding for a hydroelectric project in Sumatra that threatens the only known habitat of the Tapanuli orangutan, the world’s rarest great ape. A lawsuit is pending in an Indonesian court, and a verdict due on March 4 could see the developer’s environmental permit rescinded, essentially halting the project. The protests come amid a revelation, first reported by Mongabay, that the signature of a scientist involved in the environmental impact analysis was forged to obtain the permit. 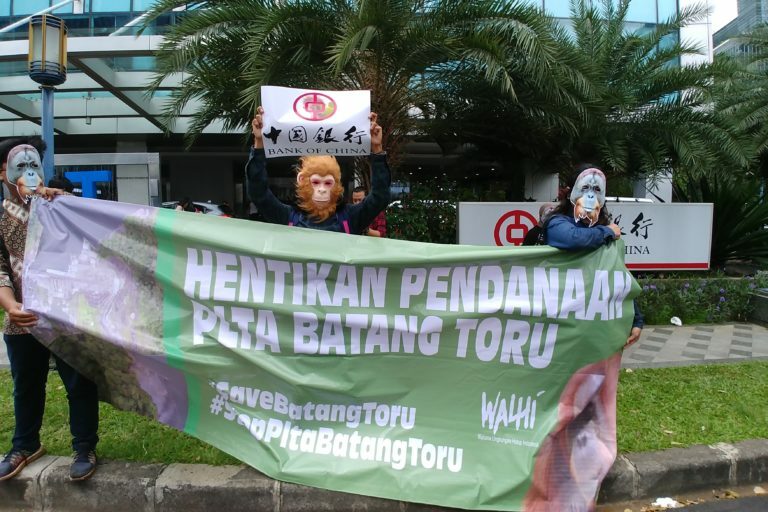 JAKARTA — Activists in Indonesia and abroad staged a coordinated protest on March 1 to draw attention to a controversial hydroelectric project in Sumatra funded by China that threatens the world’s rarest great ape, the Tapanuli orangutan. 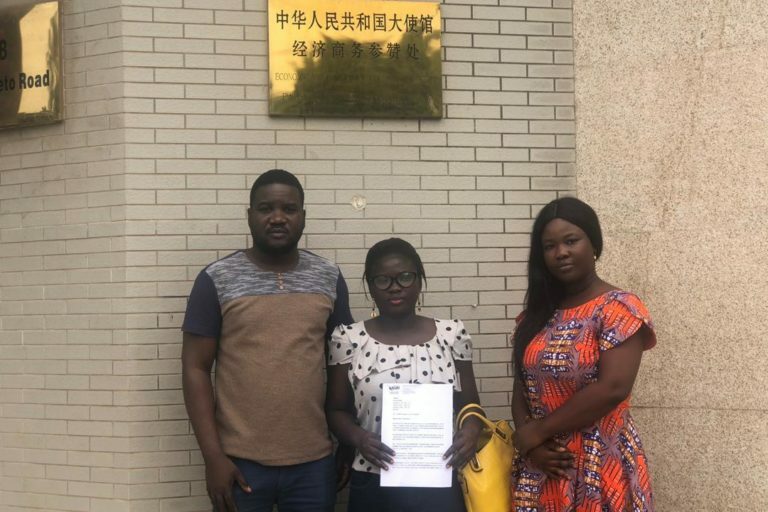 Ghana activists delivered an open letter to the Chinese Embassy in Ghana to protest against the Batang Toru hydropower project. Image by Walhi. In Indonesia, where the $1.6 billion project is the subject of an ongoing lawsuit, activists from the Indonesian Forum for the Environment (Walhi) and other NGOs called on BOC to rescind its loans, saying that allowing the project to proceed would devastate the Batang Toru ecosystem, the only known habitat of the Tapanuli orangutan (Pongo tapanuliensis). Dwi Sawung, the chief campaigner for energy issues at Walhi, said BOC had acknowledged last May receiving an open letter from Walhi, which called on it to withdraw from the project, and said it would investigate on the matter. “But there hasn’t been any news from them since then,” Dwi told Mongabay at the demonstration in Jakarta. He said that prompted Walhi to stage the latest series of protests and send another open letter to BOC branches and Chinese embassies and consulates. Walhi also launched an online petition at Change.org to call BOC to stop funding the project. Activists from Walhi staged a protest outside the Bank of China office in Jakarta, Indonesia. Image by Hans Nicholas Jong/Mongabay. The project to build the 510-megawatt hydropower plant has been controversial from the outset because of concerns about its environmental impact. Key among them is the fate of the Tapanuli orangutan, a species only described in 2017, yet already declared critically endangered and the world’s rarest great ape. But the project developer, PT North Sumatra Hydro Energy (NSHE), says the impact on the ape and its habitat will be minimal. It says building the reservoir for the power plant will flood just 90 hectares (220 acres) of its total 6,500-hectare (16,000-acre) concession in the Batang Toru ecosystem. The total area taken up by the project, once complete, will be 122 hectares (300 acres), says NHSE spokesman Firman Taufick. William F. Laurance, a professor at James Cook University in Australia who led a major study of the Tapanuli orangutan, said while the area occupied by the dam might not seem all that large, its supporting infrastructure, especially service roads, would still threaten the survival of the orangutans by splitting the already disjointed orangutan populations into smaller and smaller pieces. That would increase the chances of problems like inbreeding, accelerating the species’ slide toward extinction. The roads will also create openings into previously inaccessible parts of the forest that will be prone to exploitation by farmers and poachers. Agus Djoko Ismanto, NSHE’s senior environmental adviser, said the company planned to minimize the fragmentation problem by building its service roads along riverbanks in Batang Toru. “So these roads won’t splice up the forest,” he said at a media briefing in Jakarta the day before the protests. The developer has also called into question the presence of orangutans in its project area, citing a study by a local government agency. The study says orangutans had largely left that part of the forest before construction of the project began because of the spread of farms and settlements in the area. Fredriksson of the SOCP said her team had carried out an extensive biodiversity study of the hydropower project area in 2015, under contracted by a consultancy, ERM. 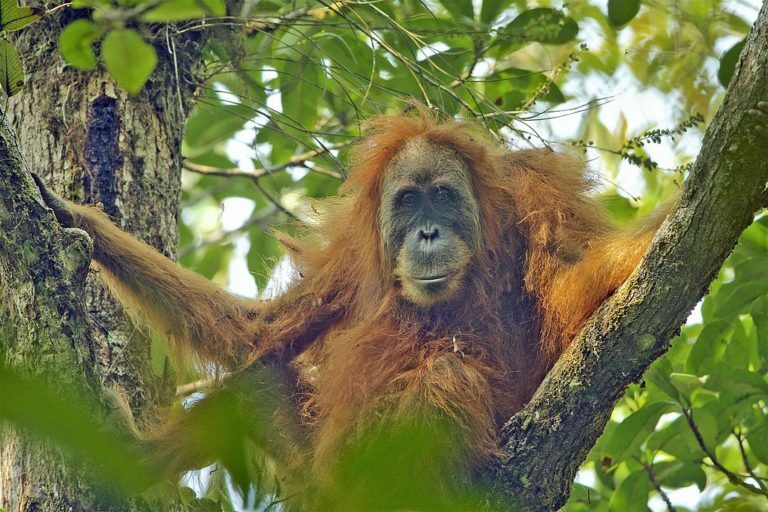 “The nest surveys showed that the lowland area along the Batang Toru River has the highest density of orangutans compared to any of the other locations in the Batang Toru Ecosystem that we have surveyed since 2003,” she told Mongabay. Laurance and Fredriksson have also questioned the credibility of Aek Nauli, the government agency that issued the study. NSHE’s Firman has rebutted the accusation, saying the company didn’t fund the study done by Aek Nauli. Even major development funders such as the World Bank have steered clear of the project because of the environmental concerns. Fredriksson said it might have been her team’s findings that spooked them. She said the findings were used by ERM for an Environmental and Social Impact Assessment (ESIA), a standard widely applied internationally to identify and mitigate impacts of major projects on biodiversity. “This report probably scared the World Bank’s International Finance Corporation [IFC] and the Asian Development Bank [ADB] away,” Fredriksson said. 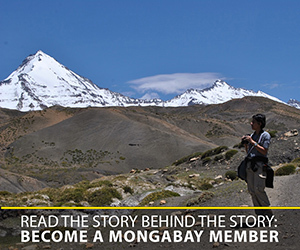 NSHE, though, said it had never approached the IFC or the ADB to seek funding for the project. WALHI’s Sawung said it was critically important, for a project in such a biodiverse area, to undergo a strict environmental impact assessment before construction. But that doesn’t appear to be the case for the locally conducted assessment, known as an Amdal, for which NHSE received its environmental permit to start building. 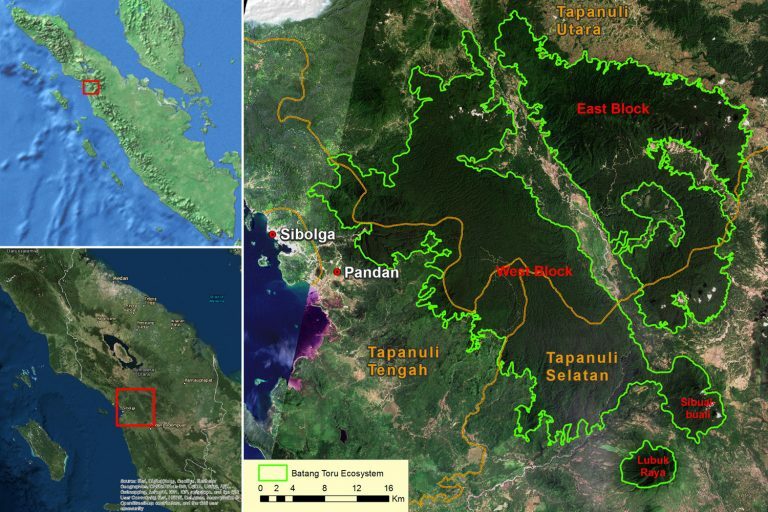 Map of the Batang Toru ecosystem, home to the Tapanuli orangutan (Pongo tapanuliensis) in Sumatra. One of the independent scientists employed to catalog the biodiversity of the ecosystem told Mongabay recently that his findings were omitted from the Amdal submitted to regulators, and that his signature on the document was forged. Onrizal Onrizal, a forestry researcher at North Sumatra University, said he worked on the Amdal in 2013, but that the final version was issued in 2016. He said he wasn’t even aware that the 2016 version existed until late last year. The revelation casts doubt on the integrity of the licensing process for a project already mired in controversy. Sawung said he hoped it would be the determining factor in Walhi’s lawsuit seeking to revoke the environmental permit for NSHE, which was issued by the North Sumatra provincial government based on the Amdal. Sawung said the only rational outcome would be for the court to rule in Walhi’s favor, given that a forged signature would render the Amdal, and by extension the environmental permit, invalid. The court is scheduled to deliver its verdict March 4. Besides the alleged forgery of Onrizal’s signature, environmentalists have also questioned the Amdal’s omission of eight endangered species from the list of wildlife found in the Batang Toru forest. The previous version compiled by Onrizal listed 23 species, while the final one has 15. Those missing include the Tapanuli orangutan, Sumatran tiger, sun bear, and Sumatran lar gibbon. NSHE’s Agus said the list was changed because the location of the project’s quarry was also changed in the revised Amdal. As a result, the new document only listed species found in the location of the new quarry. Agus said the company would ensure that no species, whether named on the list or not, would be harmed in the process of building the hydropower plant. Sawung rejected this explanation, saying all species from throughout the project site, and not just the quarry, should have been listed. Banner image: Indonesian activists staged a protest outside the Bank of China office in Jakarta, Indonesia. Image by Hans Nicholas Jong/Mongabay.